Newcastle is a culturally rich and diverse city notorious for its party life and cheap drinks, every student’s priority. However, when it comes to high end dining there is a distinct lack of options available. So, when it comes to a once in a lifetime celebratory event like your graduation, it can be tricky to choose the right place. You want to pretend you’re fancy for the night but don’t want to go blow the bank, you want good food but can’t exactly go for a fat hippo burger – no matter how good they are, and finally you’ll want some individuality. I could probably count on one hand the restaurants that accurately fit this description and occasion. One of which is the Hotel Du Vin & Bistro. Although it was my first-time dining at this bistro, it delivered a memorable experience throughout the visit. The hotel and bistro’s interior design follow seamlessly on from one another, incorporating features, such as the original shipping gates located in the outside seating area, into the overall theme to give an effortlessly classic and sophisticated vibe to the evening. The bar area leading to the restaurant is designed to suit the tone of the evening, although it is small it’s been cleverly designed to provide privacy and comfort. One noteworthy feature of the restaurant is the glass wine room, with a wine specialist on sight to recommend the perfect combination with your meal and to your palette. The hotel has a wide variety of options available, so you don’t have to worry about the fussy eater in the family going hungry. 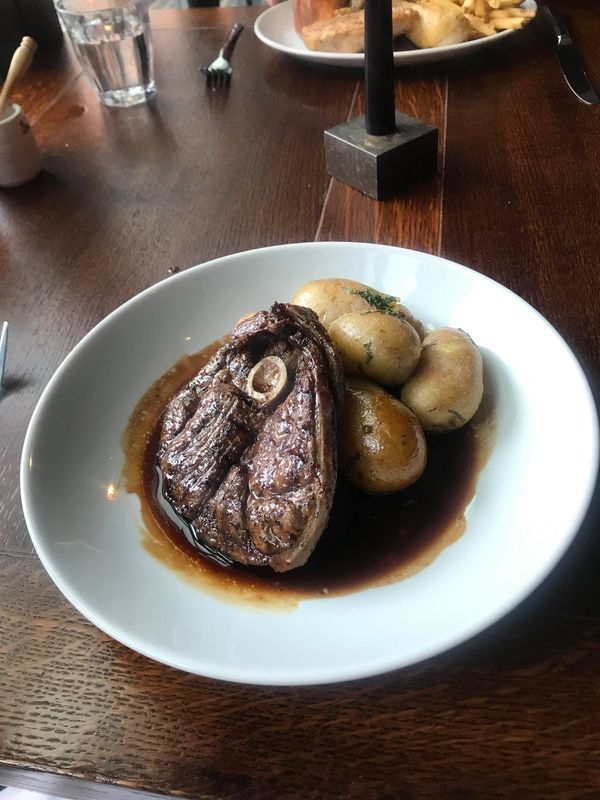 Furthermore, the restaurant has created a special three course graduation set menu, alongside revamping their al le carte menu allowing you to feel classy yet savvy with your bargain deal while you celebrate (or commiserate) your hard work over the last few years. During my visit I opted for three courses from the new al le carte menu: the porc et lapin pate, the lamb gigot with Jersey royal potatoes, a classic creme Brule and fresh bread for the table. The pate was not what I expected at first glance but left me pleasantly surprised. The rich flavouring of the pate itself was complimented by the creamy outer layer and the questionable looking relish that accompanied the dish. I would personally recommend spreading the pate on bread and only eating the relish with the pate as alone it is an intense combination but together balances beautifully. If like me you like your lamb served pink, then please request this during ordering as it did not come as standard. The leg of lamb comes cooked in a beautiful mint coating and at a generous portion size, so it would be a shame to ruin it by over or under cooking it based on your preference. The dish is served with a side of jersey royal salted potatoes which when cooked properly were light, fluffy and a delicious addition. The waiting staff and the wine expert will recommend the best wine combinations to accompany the dishes. Sadly, I suffer from migraines and did not sample their wines but my guest, a self-confessed wine lover, rated them very highly and was in awe over the vast options available. Pushing the boat out and being adventurous, I ordered the crème Brule. Despite hating custard, I thoroughly enjoyed this dish, it was glazed to perfection. The only criticism, which is hardly a criticism, would be the portion size. It was far too large for how sweet it was, resulting in a large portion of the dessert being discarded. However, there were a variety of classic and unique dessert available.